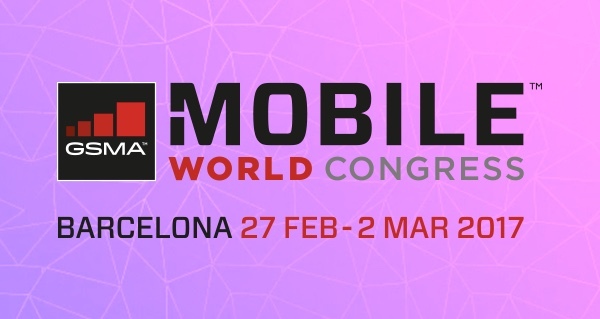 At day 1 of Mobile World Congress (MWC 2017) today, a number of smartphone manufacturers took to stage to announce their flagship Android smartphones of 2017. Chief among them were Nokia, LG and Lenovo/Motorola who unveiled their upcoming flagship smartphones for this year. Here we take a look at specs, features, price and release date of Nokia’s 3, 5 and 6, as well as LG’s G6 and Motorola/Lenovo’s Moto G5 and Moto G5 Plus smartphones. 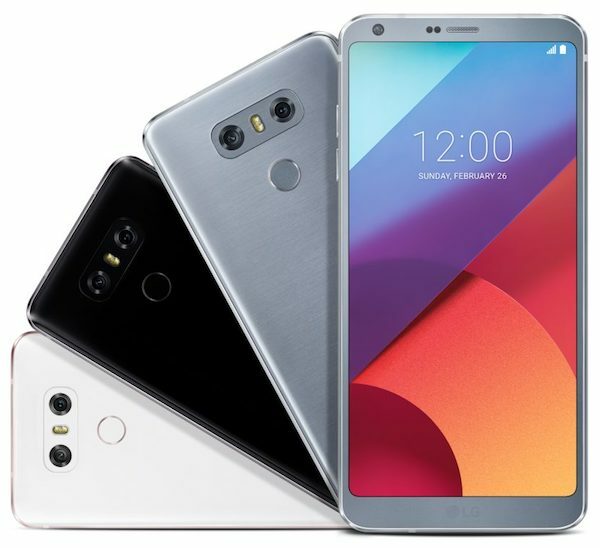 LG G6 is one of the most awaited flagship smartphones of the year. The highlight feature of G6 is its almost bezel-less 5.7-inch display bringing screen to body ratio for the G6 at 80% compared to over 70% on last year’s G5. The aforementioned bezel-less display is a QHD+ IPS FullVision panel with an 18:9 aspect ratio and a resolution of 2880×1440. As far as other specs go, G6 features Qualcomm’s Snapdragon 821 CPU, 4GB of RAM, 32GB of UFS 2.0 storage with a microSD card slot for storage expansion, a 32-bit Quad DAC for audio, 3,300mAh battery with Quick Charge 3.0 support, fingerprint sensor/power button on the back of the device, and it runs Android 7.0 Nougat with LG’s UX 6.0 skin on top and Google Assistant built right in. Apart from all this, the LG G6 is also IP68 rated for water and dust resistance. As far as cameras go, LG G6 features dual cameras on the rear. The main lens is 13MP with f/1.8 and a 71-degree field of view + OIS. The second lens is also 13MP but at f/2.4 and with a 125-degree field of view. The front-facing selfie camera on the other hand is a 5MP sensor at f/2.2 with a 100-degree field of view. 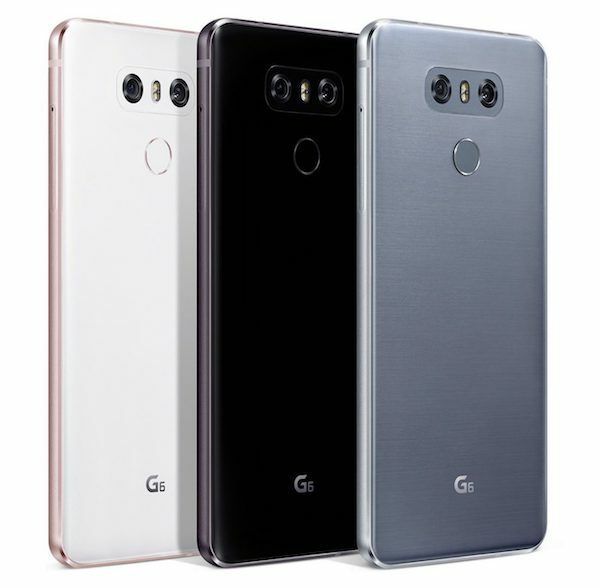 LG hasn’t confirmed pricing and availability of G6 yet but it will be available in Ice Platinum, Mystic White, and Astro Black colors at launch. 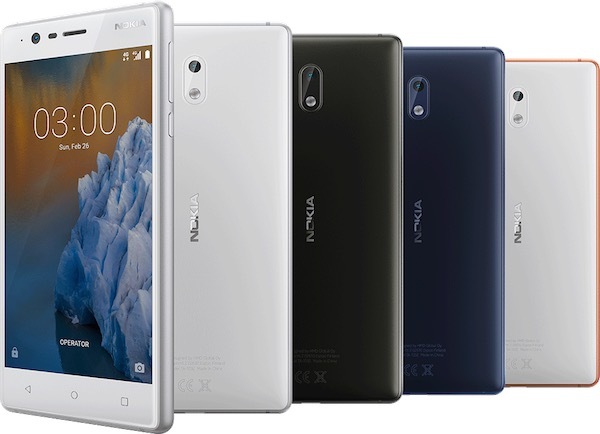 Nokia 3, Nokia 5 and Nokia 6 are all new Android smartphones from Nokia with Nokia 6 being flagship model featuring 5.5-inch 1080 full HD display, Snapdragon 430 processor, 3GB of RAM, 32GB of storage with microSD expansion, 16MP rear camera, and it runs pure stock version of Android 7.1.1 Nougat with Google Assistant out of the box. As far as design goes, it features aluminum unibody design and will cost $240 when launched outside China in Q2 this year. 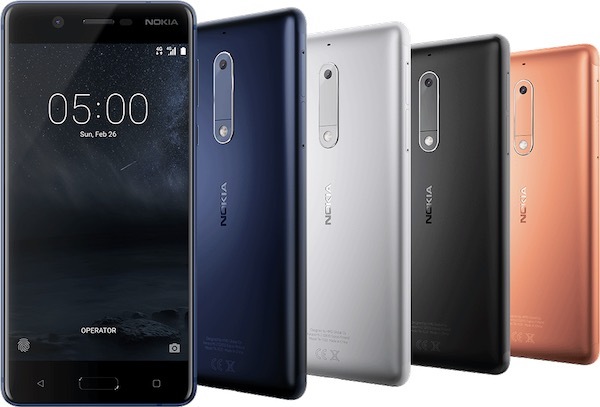 Nokia 5 on the other hand features 5.2-inch 720p display, Snapdragon 430 processor, 2GB RAM, 16GB storage with microSD slot, 13MP rear camera and it also runs pure stock Android 7.1.1 out of the box. 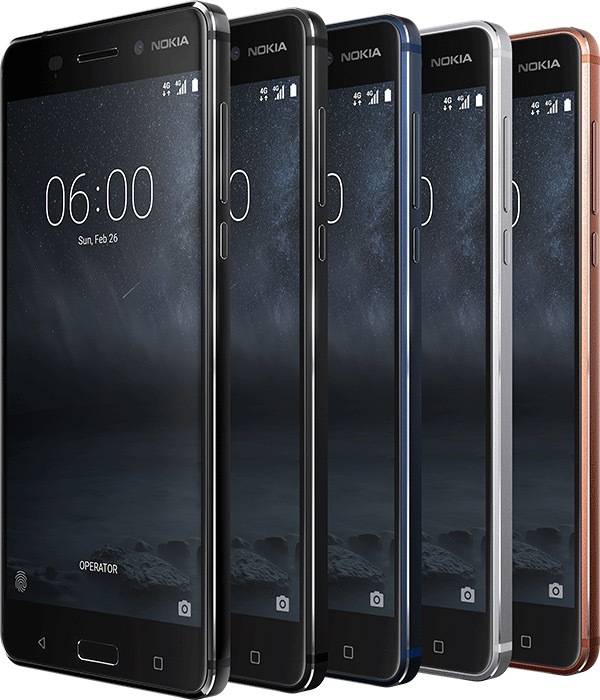 Design wise, Nokia 5 is also made of aluminum unibody with visible antenna lines at the top and bottom, along with curved edges. It will be available for $199 in Q2 this year and comes in four different colors. Launching in Q2, Nokia 3 is a budget device coming in at just $139 featuring aluminum frame with polycarbonate body. As far as specs go, it features 5-inch 720p display, 2GB RAM, 16GB storage with microSD expansion, quad-core processor, 8MP front and rear cameras and runs pure stock Android 7.0 out of the box. Lenovo has made Moto G5 and Moto G5 Plus official today. Moto G5 features 5-inch 1080p full HD Corning Gorilla Glass 3 display, 1.4GHz octa-core Snapdragon 430 CPU, 2GB RAM, 16 to 32GB storage expandable via microSD, 2800mAh removable battery, 13MP rear and 5MP front cameras, and it runs Android 7.0 Nougat out of the box. 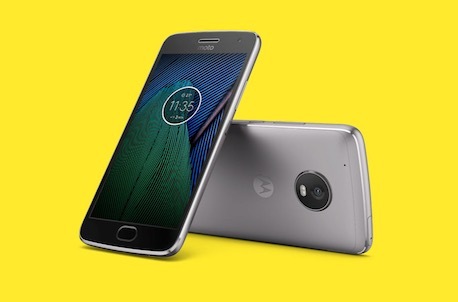 The Moto G5 Plus on the other hand features 5.2-inch 1080p display, 3,000mAh battery, 2.0 GHz Snapdragon 625, 2-4GB RAM (depending on region), 32 to 64GB storage which is expandable via microSD, 12MP rear camera, 5MP front camera, NFC for mobile payments, and it also comes running Android 7.0 Nougat out of the box. Both Moto G5 and G5 Plus will come in Lunar Gray and Fine Gold colors at launch in March and will cost €199 for Moto G5 model internationally, $229 for Moto G5 Plus 32 GB / 2 GB RAM model in the US, and €279 for Moto G5 Plus 32 GB / 2 GB RAM model internationally. Still more than fast enough. Astro Black – marketing at its finest. Fingers cross for Nokia making a triumphant return. I hope future models are more innovative than what is presented here though. It looks like everything else. If you swapped the branding on the LG and the Nokia, I don’t think anyone would notice. Im curious as to the true meaning behind the push for these curved displays… Is this a consumer readiness stage for the era of the bezel-less phone? It makes sense if you think about it.. Phones are rounded, bezel-less phonrs would have to have rounded displays (unless said phone is completely square), so why not release a non bezel-less phone with rounded corners so that over the years, lessening the bezels will be less stressful and the transition will be smoother. The G6 display is larger than the iPhone 7 Plus while being only 85% of its size. It’s the only way to get a larger display while keeping the device a size that can be grasped.